AS SEEN ON THE BBCS "THE ONE SHOW"
Welcome to Bloomsbury Wigs Hair Harvest website . As a company dealing with vulnerable patients, anxious and distressed by their hair loss, we take immense satisfaction in restoring the confidence and self esteem of so many people. We are constantly in need of hair to make wigs for hair loss sufferers. Our clients are often undergoing chemotherapy or suffering from one of the many forms of alopecia. We feel that to buy direct from a person is more ethically responsible than to buy hair from a supplier in another country. By buying directly we know that the money we pay goes straight to the seller. So if you are interested in selling your hair to us, there are two ways to proceed. You are more than welcome to go to your local hairdresser and tell them you are going to sell your hair and that you need a ponytail/ponytails cut off. It can be one ponytail at the back or various ponytails positioned around the scalp to get maximum length from the hair. We emphasize that the hair MUST BE EXTREMELY TIGHTLY SECURED IN A PONYTAIL/PONYTAILS as we need the hair to be root to tip perfect. We cannot accept loose hair. Please do not plait your ponytail(s), as we will need to assess them in their natural condition. You then send the hair to us by post. Just place the hair in a plastic bag with your name, address, telephone number, email address and the full name of who you would like us to pay the cheque to (We can also pay by PAYPAL for international payments). It will also help facilitate our dealing with your post by specifying on the envelope ‘Hair Harvest’ or ‘H.H.’ We will then value your hair and phone/email or text to let you know how much we are willing to pay for your hair. If you are not happy with the quote we will send your hair back to you free or charge. If you are willing to sell your hair for the amount we offer then we will send you the payment by cheque (or PAYPAL). Please allow up to 14 days for the cheque to arrive after your acceptance of our offer or up to 28 days from the receipt of your hair. Please secure hair before cutting and send in a presentable form. Old hair can be accepted as hair does not decay quickly. Please note that the above is a guide and not a guarantee as the valuation depends upon the quality of the hair. We will return the hair if you are not satisfied with our valuation. When making a wig, the hair is knotted, producing a four inch return hair, meaning that individual hair length must be greater than twelve inches. To avoid disappointment- Please grow your hair longer than 14" before cutting. The prices are significantly better for hair of 16" and above, so try to grow your hair as long as possible. We cannot accept hair shorter than 14" as the hair will not be long enough to produce a wig. Hair that is dry or that has too many split ends cannot be accepted either as the quality will not be good enough to make exceptional wigs for our clients. Also, if we have already had an excessive supply of a particular colour or texture, we would not be able to purchase more. Therefore, we have to say that some hair that doesn’t match up with our requirements will be returned. Please note that the prices above refer to Caucasian or European hair. We do buy Asian hair although the prices achieved will be less. 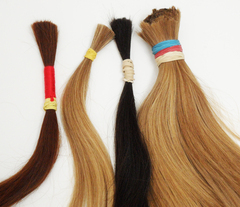 Please note that we grade the hair received in terms of quality which accounts for the variation in price range. The total length of hair that you send to us may not reflect the price outlined above as we may need to cut off any part of the hair that is not of acceptable quality for making the wigs and hair pieces. Therefore, once we have processed and graded the hair, the length of hair that can be used will be valued for the price of your hair. Please note that the weight of the hair is also important. 10% of the value of your hair will be donated to The Katie Piper Foundation, a charity that funds hair replacment systems to those suffering from hair loss due to scarring alopecia. 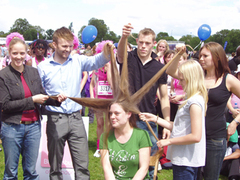 Quite often the hair we buy from you will be used to provide hair systems for such alopecia sufferers. If hair DOES MEET the above requirements please send your hair in with the following details: Full Name, Contact Number, Address and the Name the cheque is to be payable to. If your hair DOES NOT MEET the above requirements we will be unable to purchase your hair and it will be returned to you. Please note that we value hair on the length of hair deemed usable, not nescissarily the length that is sent in. If you have any other queries please do not hesitate to contact our hair harvesting department by emailing hairharvestldn@gmail.com or calling 02074301226. Please see the video above which demonstrates the process for harvesting your hair. The ponytail(s) must be tightly secured (e.g. using elastic bands) . Loose hair will not be accepted. We will assess your hair for suitability for making a wig and advise you of the price.